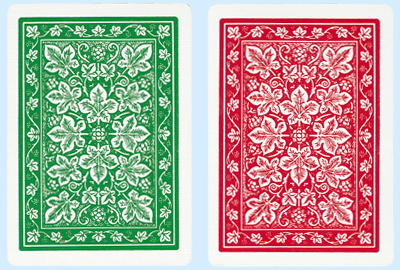 Bicycle Leaf Playing Cards feature red and green backs with an ornate leaf design. Bicycle Leaf Decks are Poker Size (2.5 x 3.5 inches with regular index faces. Each Bicycle Leaf Deck combines a fun, new look with the same exceptional quality you've come to expect from Bicycle Playing Cards. For more information or volume pricing on Bicycle Leaf Back Playing Cards, please contact us at 1-800-233-0828.